It’s true! You have the chance to win a Trip for two to Super Bowl 50 or the Pro Bowl! and adults with intellectual disabilities across Louisiana! The 2015 NFL Experience Raffle is the trip of a lifetime! Buy a ticket today to be entered for a chance to win! Call 1-800-345-6644 to purchase. Drawing will be held Friday, December 18th at 9am LIVE on Tangi 96.5! 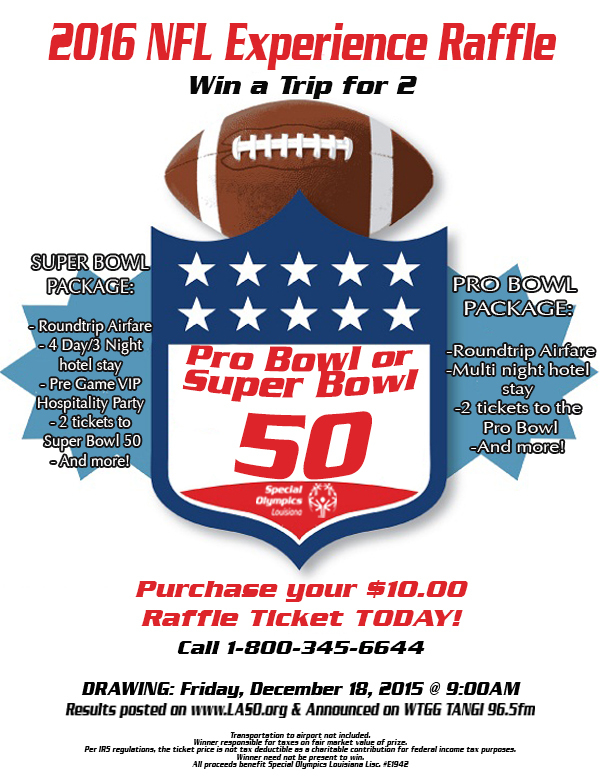 Win a Trip for 2 to Super Bowl 50 or the Pro Bowl! $10.00 per ticket could get you a VIP trip and help change the lives of children and adults with intellectual disabilities across Louisiana!